I was just browsing the Quo Vadis planners website (www.quovadisplanners.com) and noticed they have several new cover styles and colors! The first thing that caught my eye is that the Textagenda for 2011-2012 will be available with a glossy hard cover called Minuscule (click here to see). I'm especially excited about this because way back when, my sister had a Textagenda with a hard glossy cover that was then discontinued, and she's been pining for it ever since. It's back, Sis! Although I don't know how broad the appeal of the "bugs" theme will be. It would be nice to have the glossy hard cover in a slightly more grown-up theme. Even though the Textagenda is a student planner, the academic-year format is also useful for teachers and parents of school kids who might want something more "age-neutral." 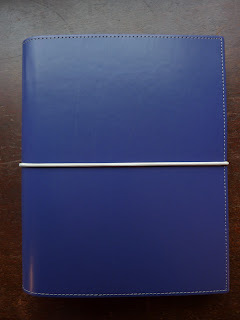 Still, it's a nice and durable cover option for this very popular planner. 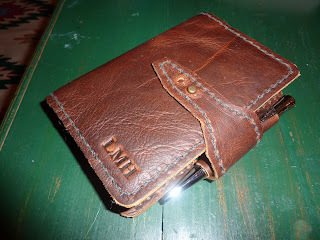 There's a new genuine-leather cover that has the added advantage of having a pen holder! The Duo cover (click here to see) has a strap-snap closure and a two-toned color scheme. There are also some new colors added to the current cover lineup, including a purple Smooth cover (click here to see) and a purple design for the Polypro Spiral cover (click here). Just based on the new cover designs and colors, it seems like QV is increasing their marketing to the younger female crowd. Most of the cover options now come in a wide choice of colors including pink, purple, and green which is nice to see. They still have plenty of cover options in black, red, blue and brown as well. What do you think about the cover color options? What other colors or styles would you like to see? 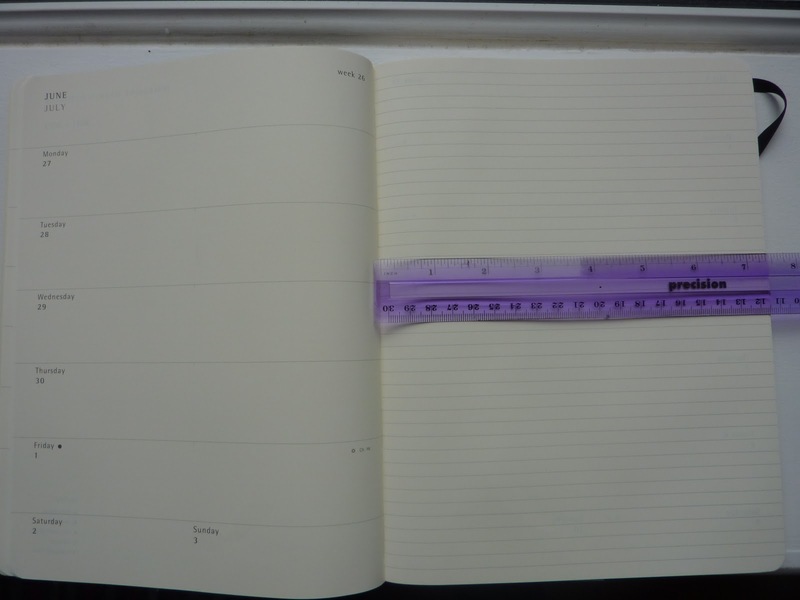 Today I am starting to use my new A5 Domino Filofax (in the gorgeous new Ultra Violet color, click here to read more details and see more photos) with the Quo Vadis Timer 21 weekly inserts that Steve so generously sent me (click here to read more about that). The Quo Vadis Timer 21 inserts are from France, and have the same layout as the Quo Vadis Trinote planner that I've used so successfully in the past. 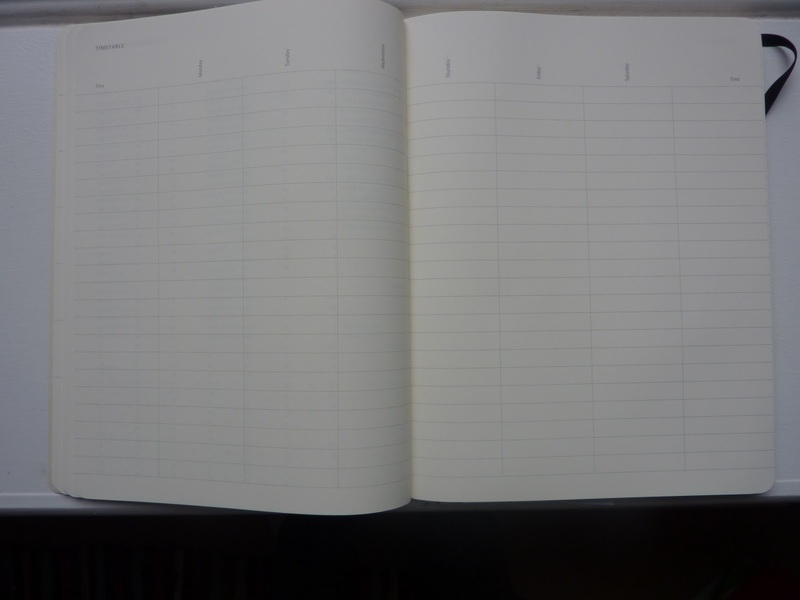 Using this format in a Filofax solves the complaints I had about the Trinote: no monthly planning grid calendars, not enough pages for notes. But the question is, will I get fed up with the size and weight of the book? 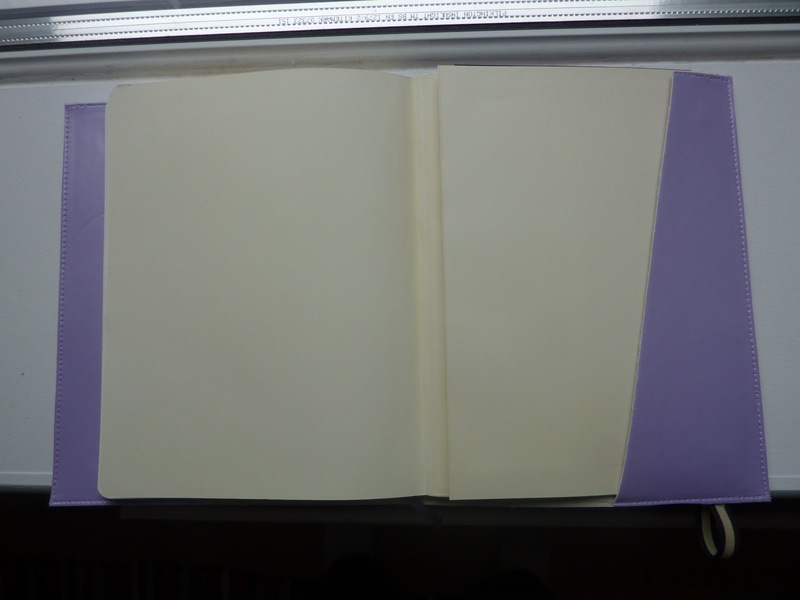 I have tried to use an A5 Filofax as my planner a few times before over the years and quickly abandoned it each time because the huge book is too big to carry around with me everywhere. But if I can get away with leaving my planner at home almost all the time and bring it only when I know I will need it, then maybe this will be a non-issue. Let the Planners Battle commence!!! We all know Paperblanks planners and journals have beautiful covers. But unless you've actually used one, you don't know just how great the paper is. The kind folks at Paperblanks recently emailed me with this video showing how much care and thought goes into Paperblanks products. They pay particular attention to the quality of the paper, resulting in an exceptional writing experience. This video explains how they upgraded their paper in 2008 to make it exceptionally fountain-pen friendly and specifically to minimize feathering. We made it to Jakarta! We are all exhausted and jet-lagged, and disoriented. Luckily we have the weekend to rest and find our way around a little before my husband starts work on Monday. First impressions of Jakarta: huge city, very busy, confusing, tropical and hot! We'll have a steep learning curve as we settle in here. Today is the day I depart for Indonesia. I am extremely sad to leave Scotland. Living here was a dream of mine for a decade, and I'm very sad I wasn't able to live here longer. But, I'm glad I got the chance to live here at all, and I know this is a place I'll always come back to. I'll be offline for a few days while I'm in transit. I've been promised the internet connection in our new place will be up and running when we arrive, so I'll be back online as soon as possible! Before I go I just want to thank you all so much for reading my continued planner angst while preparing for this move, and last year's move too. You are probably tired of reading posts about moving! Thanks again everyone! I plan to be back with you soon. Coming in the next several months here on Plannerisms you can follow an epic tale of planner battles. Who will reign victorious? Only time will tell! My question is, if I use this format will I miss the structure of the daily columns? Or will the freedom of the open day spaces win out? Then the smackdown will begin as my Filofax goes to battle with the extra large Moleskine weekly notebook, which begins the same week. This will be a classic battle between a ring binder vs. a bound book planner. 3) a full page each week for notes. But by then, will I be so ensconced in my Filofax that I won't want to switch? 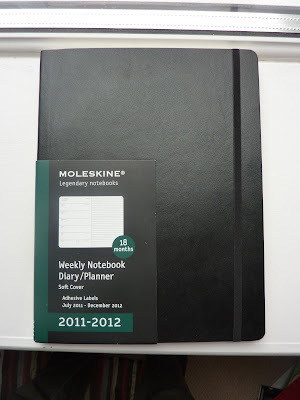 Or will the portability and page size of the Moleskine win out? I'm featured in the March Carnival of Pen Pencil & Paper! 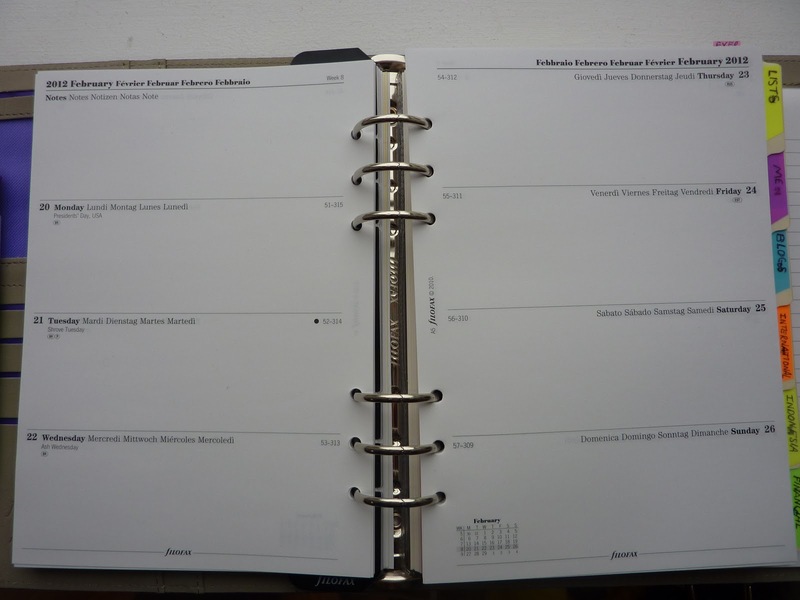 And Steve's excellent post on Philofaxy Time Management With Filofax - Diary Options is featured too! Well done Steve! 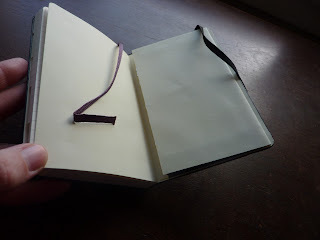 Many thanks to Savannah for posting a comment on my Location Notebook post suggesting I get a Moleskine Info Book. I was browsing in my local bookstore the other day and saw it there. Even though I thought the price was steep at 10 pounds, I thought it would be very useful to hold all my Indonesia-specific information. I'll be able to add to it the entire time I'm living there and use it as a resource and record. I'm keeping this Info Book in my Renaissance Art cover, which looks great and keeps my pen handy. So what have I learned after 3 years and more than 30 planners? 2) I have a short attention span. 3) I love the idea of using a day per page planner, and when I do use one I love how much space I have each day to record lots of details. But every time I try to use it, the daily format falls down on me in the planning department. I learn and remember things visually, so I have to see an entire week at a time or else I forget upcoming events. 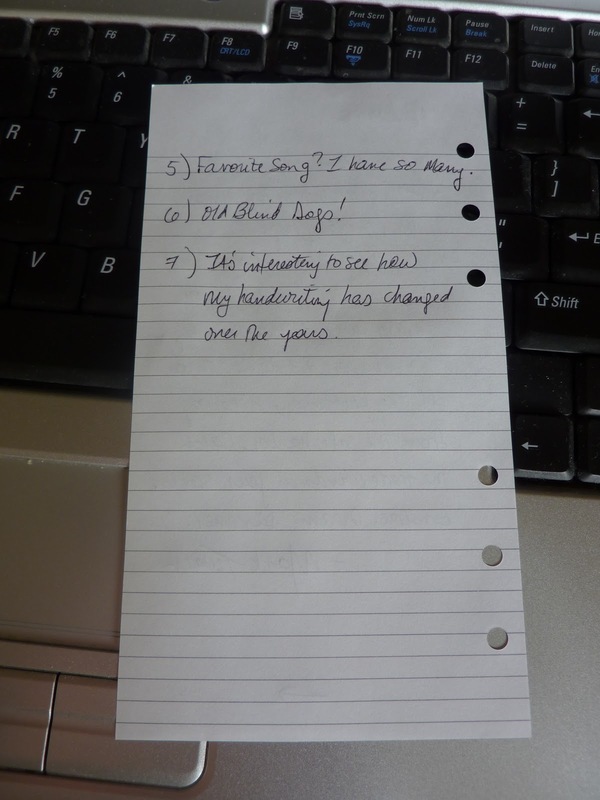 4) Similarly, I am very out of sight, out of mind so I have to have my to-do lists for the week on the weekly pages. Therefore I have to use some form of week + notes format. 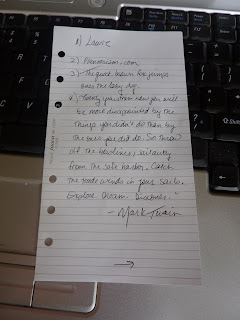 5) I like to write a lot each day. Tasks, appointments, things to remember all go in today's space. Lots of weekly planners have failed me because the day spaces aren't big enough. I started comparing failed weekly planners with ones I've had success with, and noticed a trend with day space sizes. So I did a little math. Below are measurements of day spaces in planners that have failed me mainly because of too-small daily spaces, and ones that I've had success with. 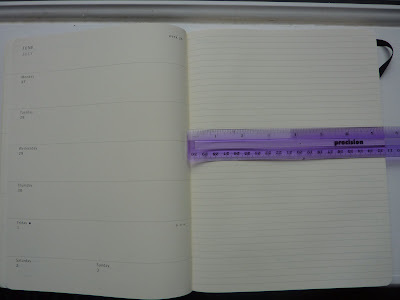 Moleskine large weekly notebook day spaces (weekdays): 39 square centimeters. Weekend days half that. Life Book day spaces: 41 sq cm (all days). 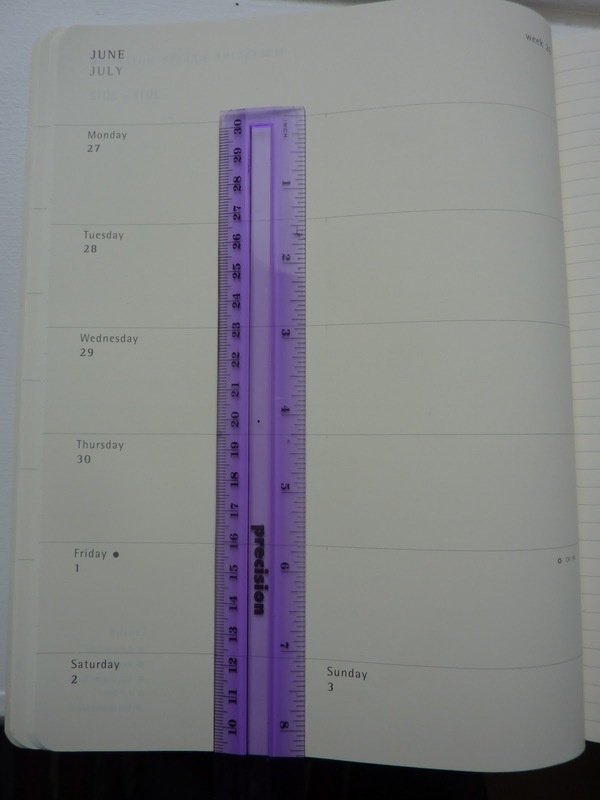 Filofax week on 2 pages (personal size) weekday spaces: 45.25 sq cm. Weekend days half that. Quo Vadis Minister: 67.2 sq cm (all days except Sunday). Quo Vadis Trinote: 87.4 sq cm (all days except Sunday). Both of these planners have been very successful for me. Whenever I've stopped using these, it's not due to the day size (except for once last year with the Minister during an extremely busy time), it's due to some other reason. 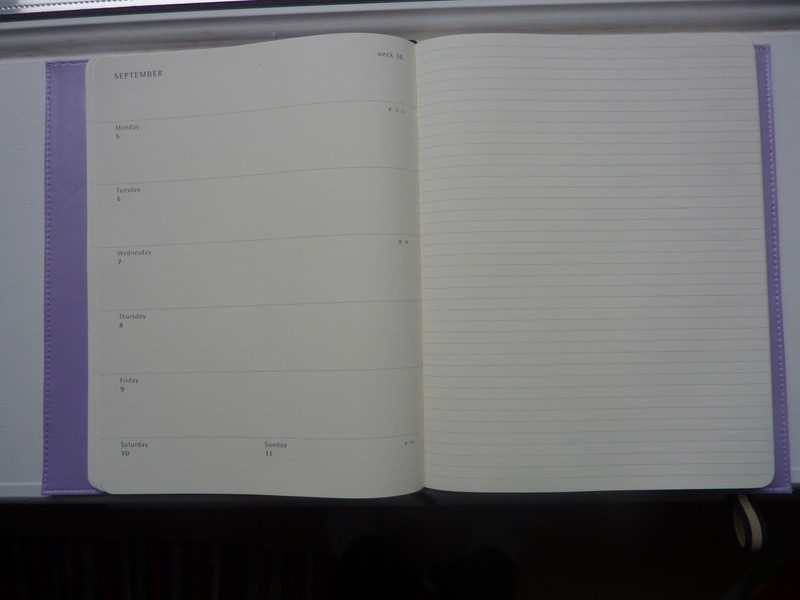 The next planner contender is the Moleskine Extra Large weekly notebook which starts in July. Its weekday spaces measure 68.4 sq cm (weekends half that). That's well within my successful day size range. And having the entire opposite page for overflow, lists and notes will be beneficial too. I'm looking to move over into an academic-year planner this summer, so if the Extra Large Moleskine weekly notebook fails for whatever reason, I plan to go to the Quo Vadis Septanote, which is the academic year version of my biggest planner success so far, the Trinote (with only a few variations, read my comparison of the two here). It feels good to finally have some hard facts on what works for me and what doesn't! 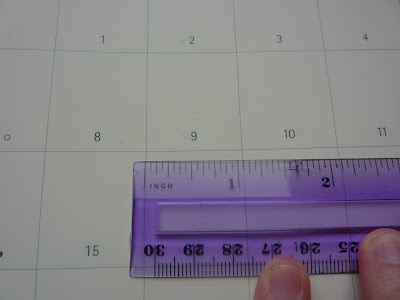 I think it's safe to say that the smallest day size that will work for me is probably 65 sq cm. And I have to have space for lists on the weekly pages. I also have to have monthly calendars, and if my planner lacks them I put them in (like I did with my Minister and my Trinote). My planner has to have a pretty cover, and if it doesn't I'll hack one for it (like I did with my Moleskine/ Dodo Pad cover combo which you can read about in this post). 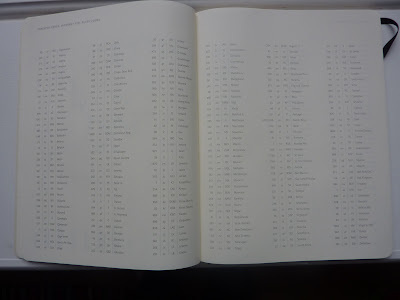 I do realize that large day spaces in a weekly format with notes means a large page size and therefore a large book. I have come to accept that. Luckily I carry a large bag. 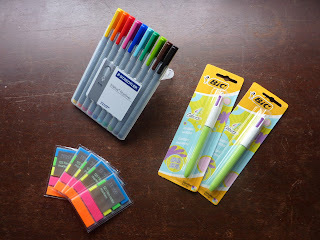 I feel like I'm closing in on Planner Perfection! Or, as close as is possible for me. Over here at the right I have created an ongoing tally of planners I have used this year so far, complete with dates of use. Because to be honest, even I can't keep track of what planners I've used and when! At the bottom of that section I also added my planners tally for 2010 (updated with 3 more planners I tried after I published that post) and 2009. 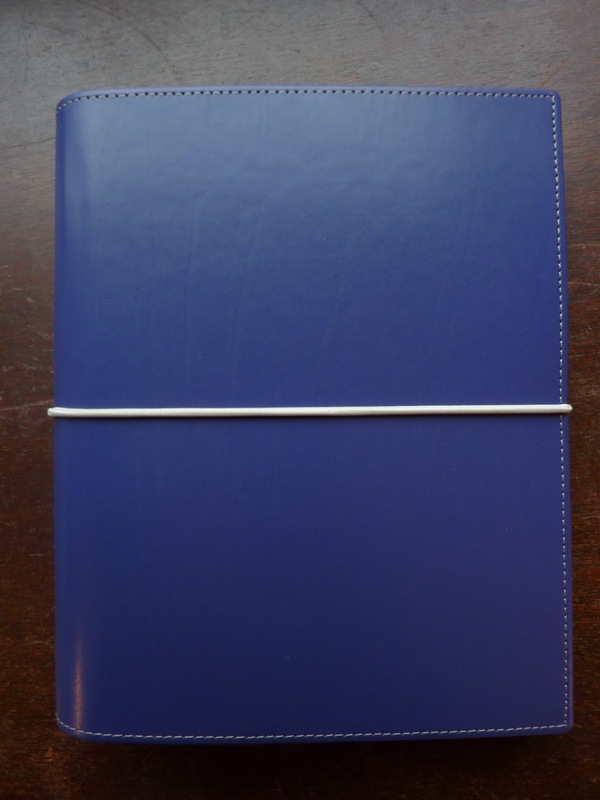 I'm noticing a pattern: I tend to cycle through a large week to view (Trinote, Minister), a personal size Filofax format of some kind, and a day-per-page planner with some other new and interesting planners thrown in for variety. 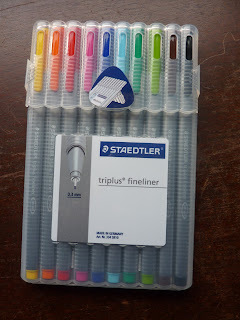 You can see I bought more of the Bic 4-color pens in the limited edition colors (which I blogged about here). I love the color variety of the Fineliners, but I don't know about their staying power. Does anyone know if they are archival/ acid-free/ fadeproof? Thanks for any info! 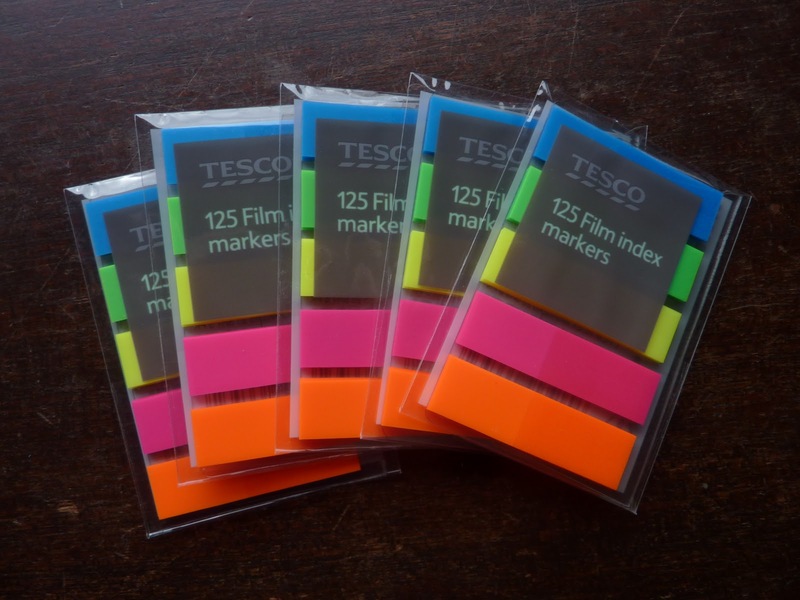 These are identical to the tape flags that come on the Filofax sticky notes accessory, which I use in every Filofax I own. It's much cheaper to buy these little packs and refill my sticky notes pages with them than to buy a whole new accessory. 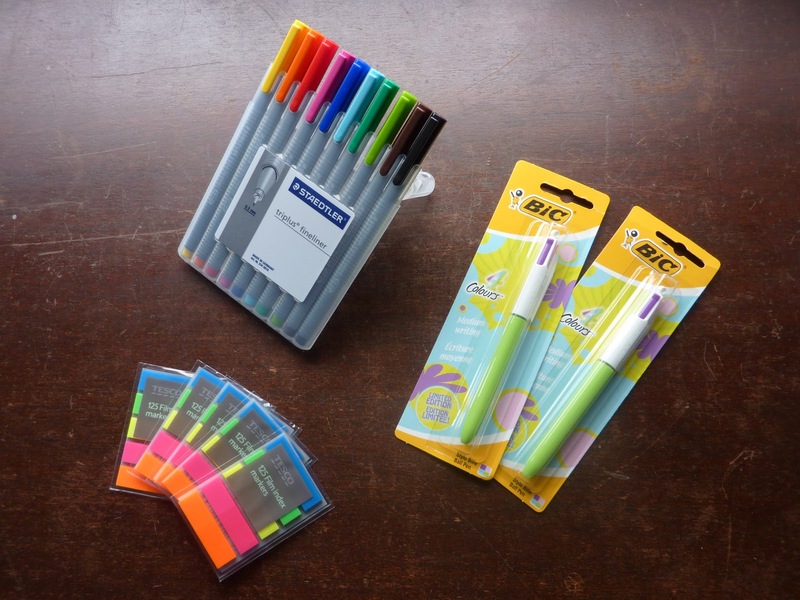 Have you discovered any great stationery finds recently? Last night I filled in my new 2011-2012 Moleskine planner (which you can read about here) with family birthdays and the American holidays (which I like to write in since Moleskine doesn't print the name of the holiday on the day spaces). Normally when I "set up" a new planner, I write in upcoming events, appointments, and local contacts. Then I realized, I don't have any. Moving to a new country is unnerving in a lot of ways. 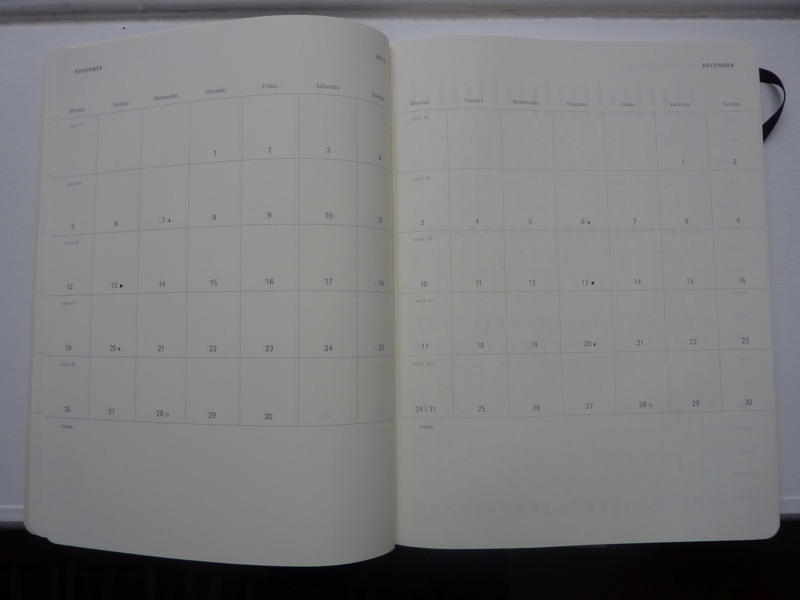 Part of that for me is the "empty planner" syndrome. I have no plans past March 23rd. I don't know where I'll be living (beyond a general idea). I don't have an address or a phone number. I don't know anyone there so I have no contacts. I have nothing to write in my planner. A similar feeling is that of "no keys." That happens when I leave someplace and am in transit to someplace else. I don't own a car at that moment so I have no car keys. I left my old house behind and am not at my new house yet so I don't have house keys. You get the idea. Having no keys makes me feel like I'm caught in the middle of two realities, past and future. I'm feeling like that right now with my empty planner. My plans for the next couple of weeks consist mostly of preparing for this move. But then once that is done, I have no set plans. 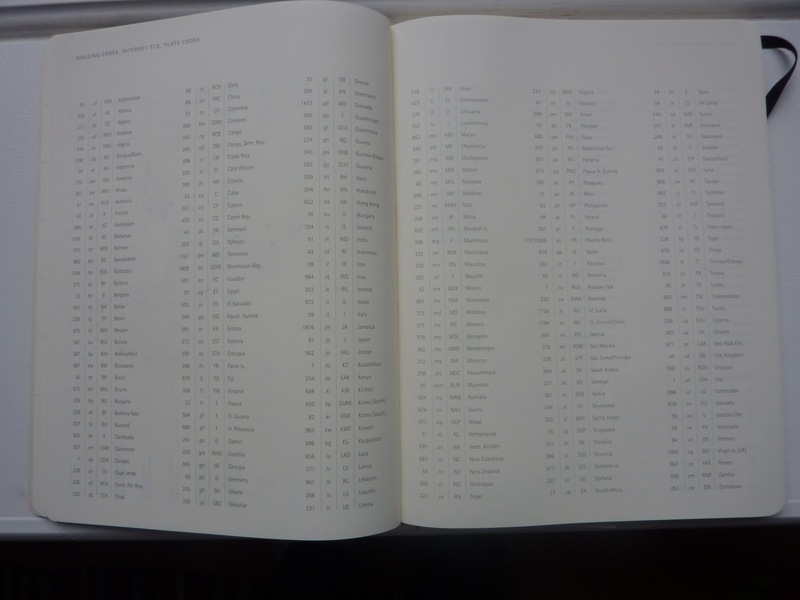 Just pages and pages of empty day spaces. For a planning person like me, it's very unnerving. Ever since I ordered this planner yesterday from The Paperie UK I've been thinking about it nearly incessantly a lot. I expected it would arrive early next week. Imagine my delight when it arrived TODAY! I just ordered it yesterday! And the shipping was free!!! Please excuse my less-than-perfect photos taken hastily in my windowsill in my excitement about posting this as soon as possible. You can click on the photos for a larger view. Once I got done hyperventilating, I ripped off the wrapper to inspect the monthly calendar situation. 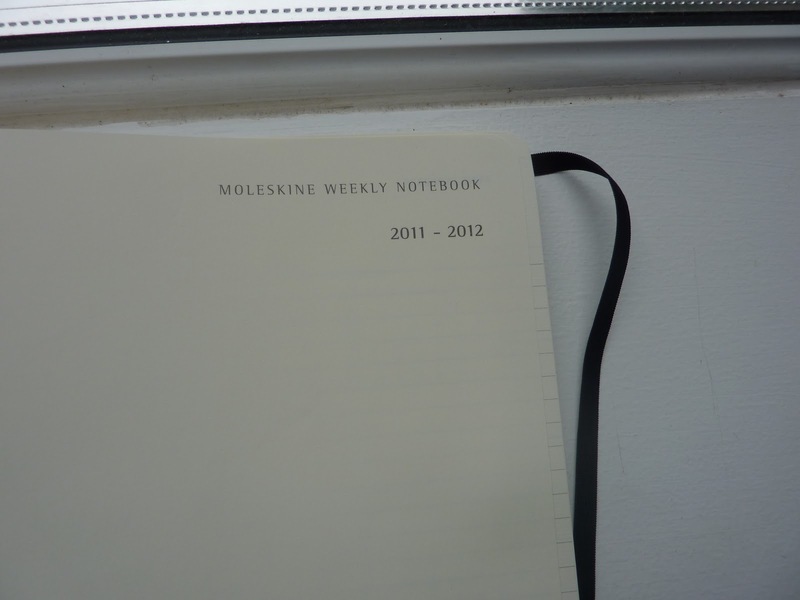 You see, in my excitement last night I was surfing Moleskine websites and looked at MolekineUS to see if their 2011-2012 18 month planners are in yet. They weren't, but they are listed as "coming soon." (***Update: the 18 month planners are now available for purchase on MoleskineUS, click here for the product page.) But I noticed, with alarm, they have noted: "Also included is a monthly view for the year, in column format on a 6 page spread." Noooooo! I tried not to panic thinking my beloved months with days as squares were gone after only one publication year. But I am extremely happy and relieved to report that the monthly calendars with days as squares are there! Whew! **Edited to add: I especially like the spaces at the top and bottom of the monthly calendars. In the top space I write things that are due that month, like if someone is due for a vaccine booster or if my insurance is due for renewal. In the bottom "Notes" space I write goals or projects for the month, progress toward them, and anything else specific to that month. Click on the photo below for a larger view. And I love that entire right page for lists, notes, reminders, quotes, party guest lists, whatever! This timetable is extremely handy even for those of us who are not in school ourselves. 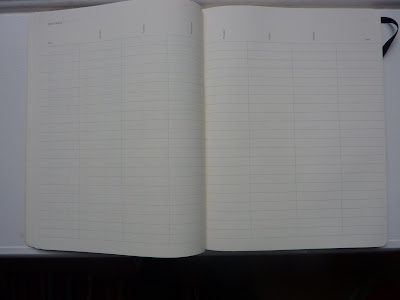 I will use it to keep track of the busy schedules of each of my family members. There's a 2-page spread each for the fall and spring semesters, so I can stay on top of who needs to be where for after-school activities. 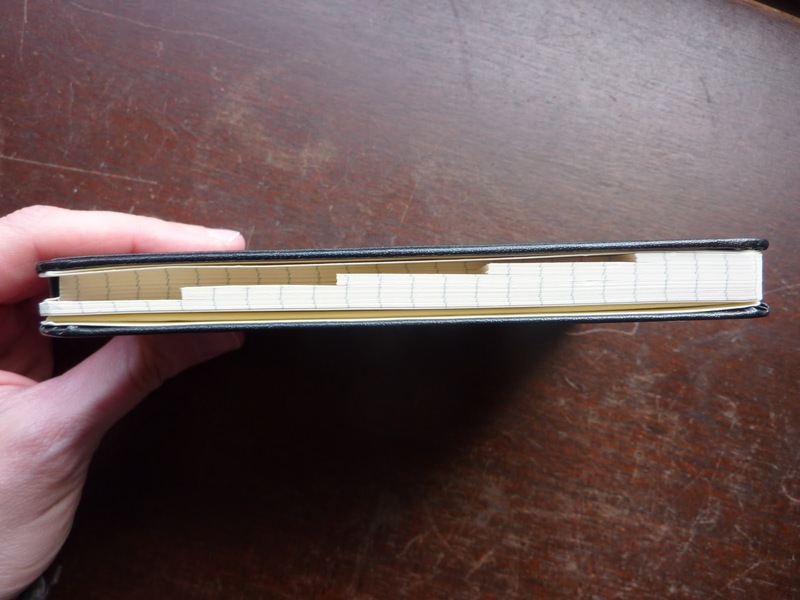 My biggest complaint about Moleskine planners is that I don't like black covers. I find them boring, and a little depressing. Of course I would prefer purple. 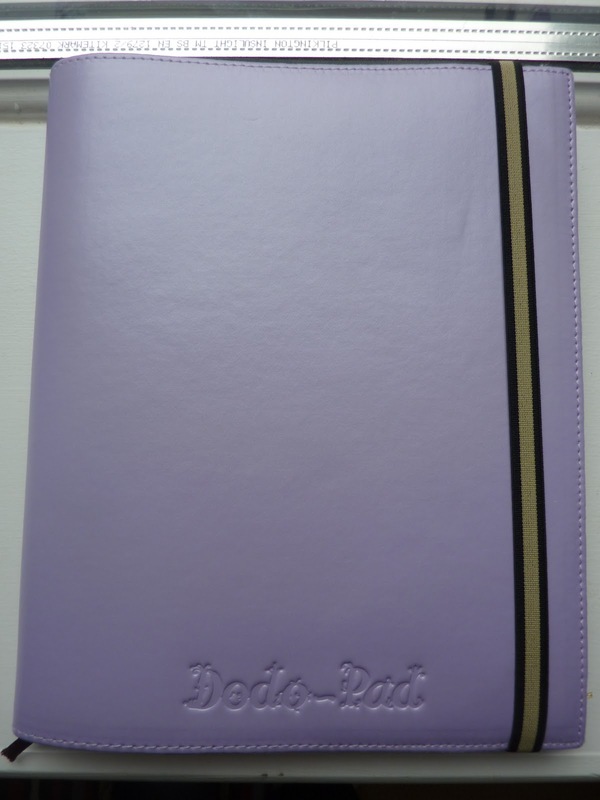 Then I had a sudden realization: my faux leather Dodo Pad diary cover in iridescent lilac is the same size as the Extra Large Moleskine!!!!!! And I get to look at the beautiful lilac color around the edges of my weekly pages every day! Not to mention I get to handle the softness of the cover all the time. Enormous planner + cover combo Win!!! 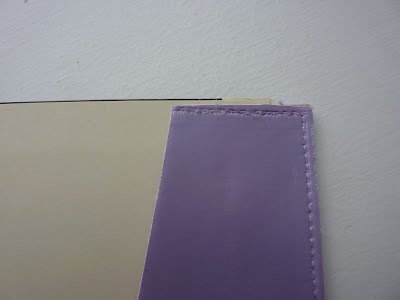 So now I have a Moleskine planner that will carry me through all of next year, in a gorgeous and soft purple cover. You guys!! I may have reached Planner Nirvana with this!!! 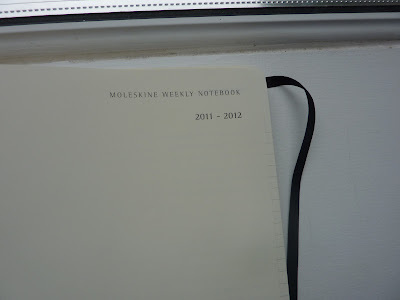 New Moleskine products out soon: pens, bags, glasses and more! Imagine my surprise when I just now discovered that Moleskine is launching a whole new line of non-paper products for reading, writing and traveling (3 of my favorite activities)! I'll let you read all about it over at Scription (click here). Pens! Bags! Accessories! Yet more things for me to desire. 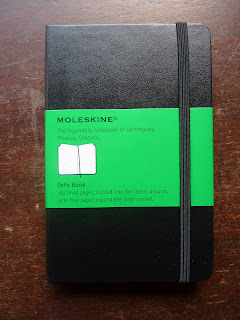 Moleskine, why do you know exactly how to push our buttons??? 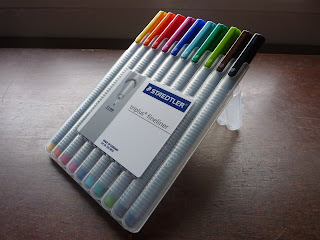 Written by hand: I've been tagged, and you're next! Robin recently tagged me over on her blog (which you can click to see here) to answer some questions in my own handwriting. You asked for it! Good luck reading my crappy penmanship. In school my teachers always gave me crap about my poor handwriting. It has actually improved over the years, at least in the way of being more regular in shape and size. 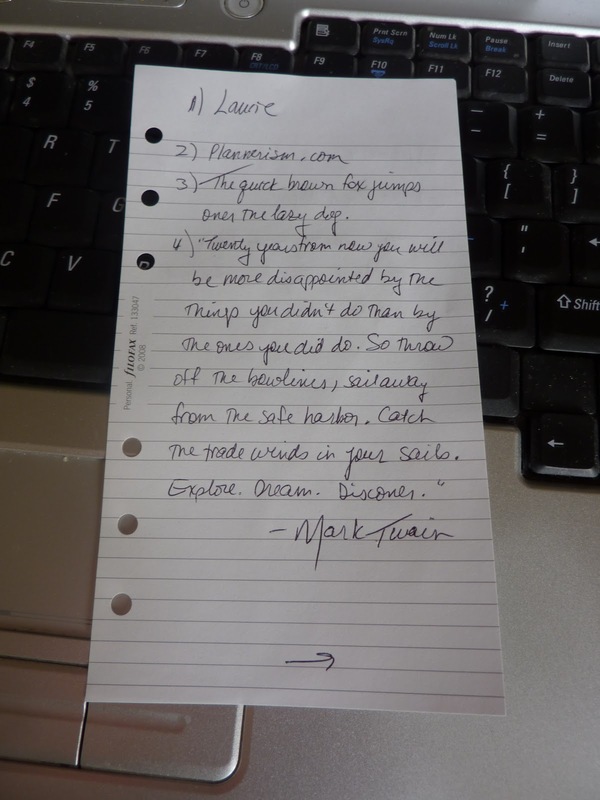 I've always wished I had neat, legible handwriting. One summer in my early 20's I decided to practice my handwriting diligently in an attempt to improve it. It helped a little, but not much. 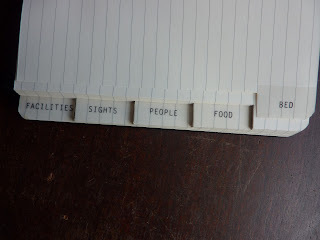 I wrote the pages below with my Bic 4 color pen, on a Filofax personal size lined notepage. 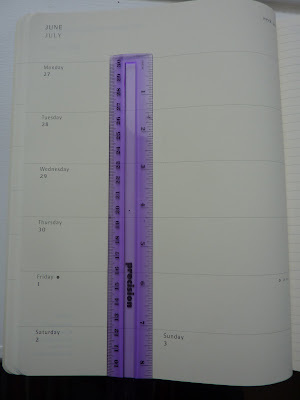 This will also help you see why I consider the personal size Filofax pages too small for my needs most of the time. I wrote every-other-line because the ruling is too small for my handwriting. And, I had to continue on the back side of the page. Robin's questions are listed below, and I've typed my answers in case you can't read what I've written on the page! I like to remind myself of this quote when going into the unknown and going outside my comfort zone (which happens often in my life). 5. Favorite song? I have so many. 7. Anything else you want to say? It's interesting to see how my handwriting has changed over the years. Now it's your turn! Post your version of this on your blog, and please post a link to it here in the comments. 2011-2012 Moleskine 18 month planners available now (already!)! 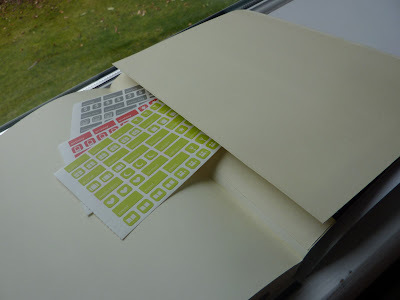 Yesterday when I received the tweet from The Paperie UK (@thepaperie) that they have the 2011-2012 Moleskine 18 month planners (click through here to see their page) already, I could hardly believe it! Is it that time of the year already? First of all, I want to pat The Paperie on the back for offering us the chance to buy planners for next year in February. Wow!! Second, I have to force myself not to panic-buy these planners in every size, because they do sell out very quickly. If you wait until July when they start, they may very well be gone by then. One year my sister decided she wanted one in August and had to search far and wide, and then was very lucky to find one at all. I love these planners for their excellent layout (which I reviewed the 2009 version of here and the 2010 with monthly calendars here). The week + notes format works very well for lots of people in various circumstances: students, parents, business people, anyone really. I love that they start the week of end June/ beginning July and go all the way through the end of the following year. 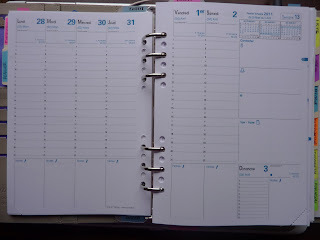 That way you have a 6 month window in which to begin your planner. There's lots of reasons why this is useful. Those of us jonesing for a new planner mid-year can start it right on the first day. For students, teachers and parents in the US and Scotland who start school in August, you can start it then and use it for the entire school year. 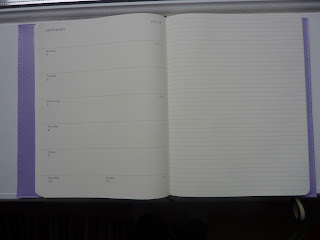 Here in the UK I've discovered that many of the academic year planners begin in September, when England starts school. That's too late for those of us who start in August. 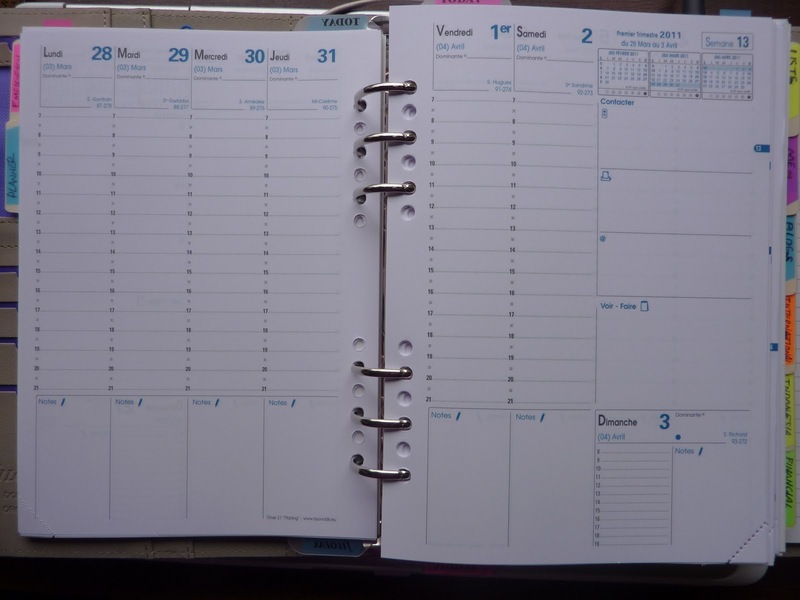 The 18 month planners give everyone starting school in autumn the opportunity to start the planner at the beginning of the school year, no matter which month you start school. 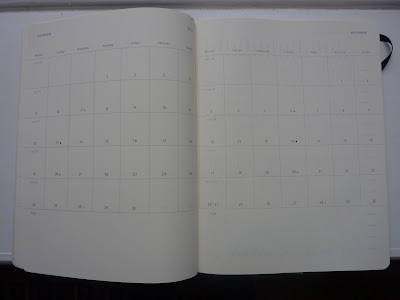 I hope Moleskine has kept the monthly calendars with the days as blocks to write in, instead of reverting back to the months as columns which were in the previous-years' Moleskine planners. I know there were a lot of people who cried out for the return of the monthly columns, so much so that Moleskine made them available as printouts on Moleskine.com (although I can't find that template now). But the monthly block-calendars are so much more useful for those of us who need to visualize each month. 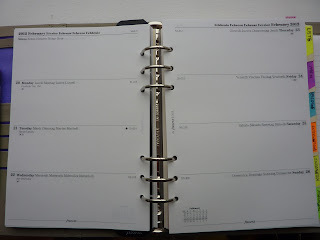 I love the idea of buying a planner now that will go all the way through 2012. I have a freakish desire to plan ahead as much as possible. I'm trying to resist buying one right now for a couple of reasons. I am really loving my Quo Vadis Minister weekly planner, and I don't have any desire to change from it. I don't really need the Mole. It has failed me in the past. And, I don't know what my planner needs will be in Indonesia. My Minister might continue to work great for me all year. 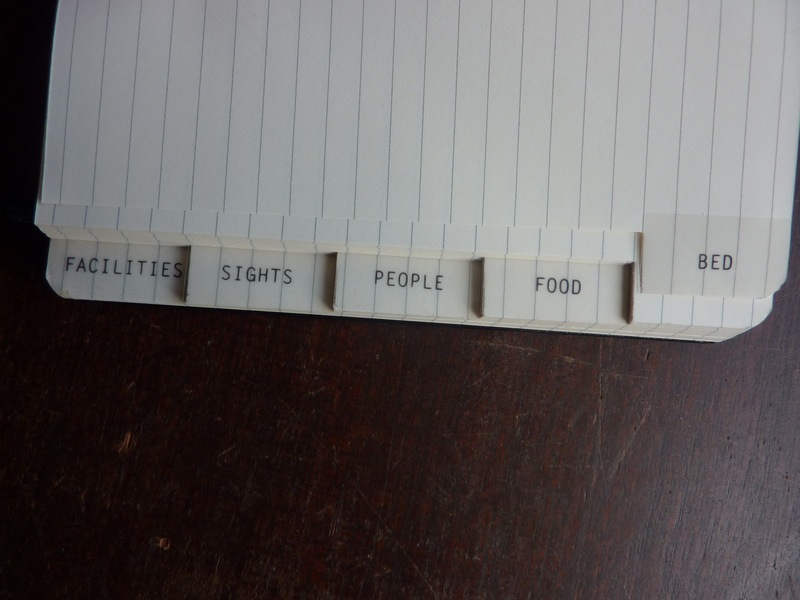 Or I may find new and glorious planner possibilities there. But can I resist buying the Mole? It appeals to me even if only for the comfort factor.